EXETER – The residents of Exeter were left without water for a night three weeks ago when a broken water main on Kaweah Avenue near the water tower was under repair. As a result people were under a boil water notice along with businesses. Restaurants had little choice other than to shut down for fear of sanitation concerns. Now, as new city manager Adam Ennis told the Exeter City Council during their July 12 meeting, there are an unknown amount of potential problems throughout the city’s water system. “We need to determine what the needs are; then see what they can do about it,” Ennis said. 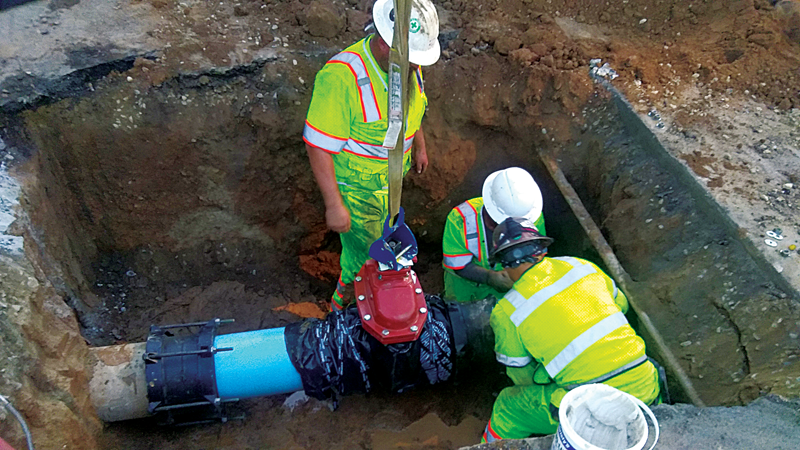 In a mixture of short- and long-term strategies, City administration knows they are in need of valves to isolate water breaks at the neighborhood level. But what they need most is an indication of how much to charge water users. Ennis said during the council meeting that part of the long term strategy is to determine the system’s operation costs, repair costs, replacement costs and upgrade costs. Then they will evaluate the water user rates in addition to impact fees. Ultimately, the needs will be determined by developing a water master plan currently in the works that cost the City $152,740. This plan will be their newest in 11 years. Former interim city manager Eric Frost said the plan’s purpose is to identify where new wells, pumps and water storage should be placed to support growth around the city, in addition to an overall status of the system. The question though is how much the system will cost to fix when problems are identified. As of now it is a huge question mark on the Exeter budget. Councilman Gordon Gerdes said he anticipates the costs to be big but without a doubt necessary. “It’s expensive we all know that. But when you have pipe that old that’s still in the ground it could go,” Gerdes said. The cost to repair the main on Highway 65 is estimated to cost between $30,000 and $35,000. Although, as Ennis and public works director Daymon Qualls said the firm they hired on short notice, West Valley Construction also installed a new valve. Ennis said part of the problem in the system is a lack of shutoff valves around Exeter which has handicapped the City from containing problems like these. Although, Exeter is not unique to infrastructure woes. Exeter’s newest city manager added that infrastructure has been a thorn in nearly every city’s side. “Most of the communities are dealing with aging infrastructure…I don’t think I’ve picked up an engineering magazine in the last 10 years and not seen an aging infrastructure story in it. It’s happening all over the place,” Ennis said. The main the City repaired on Kaweah was 80 years old and deteriorating. When crews managed to bring the burst pipe to a relatively small leak with collars, the main was stable but for only a short time. Ennis said tightening the collars was beginning to crease the pipe and wasn’t likely to hold for long. Part of the decision to fix it on the night of June 30 was to ensure the City could respond in case of any unexpected fire emergencies on the Fourth of July.